Playpark All-Stars 2018 Finals is Playpark's biggest tournament series that will determine Philippines' newest champions on the field of MMORPG. The Finalists will meet at the arena of Skydome SM City North EDSA on August 19, 2018. This event was made possible by SM City North EDSA, NVIDIA, AORUS, PC Buyer's Guide, Redragon, Zotac, Fatboys Pizza and Pasta, Palit, Corsair, and MSI. 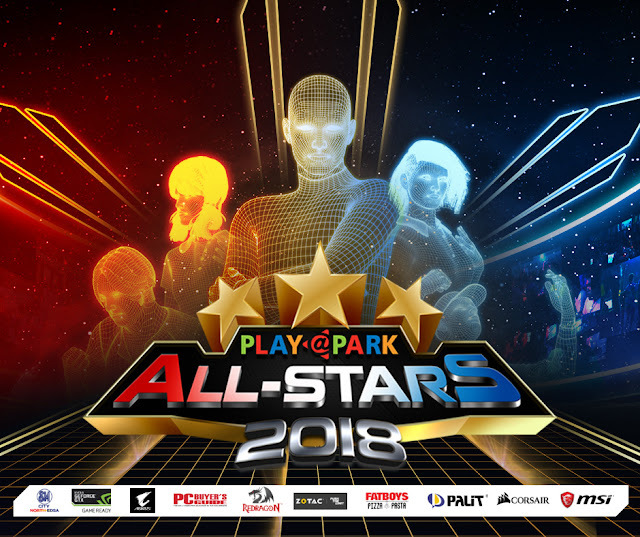 The one-day event hosts the grand finale of Playpark All-Stars 2018 tournaments. Top two teams from each nationwide tournament meet at the grandest stage for esports superstars. Expect thrilling battles between YesPogi and Wagkangmainis in the Cabal Online 5V5 Carnage, while Haawhoow and Exilium vie in the RF Online Elite Squad Championship. Audition Next Level takes it one step further by bringing in contenders for the Southeast Asian crown from Thailand, Singapore and Malaysia at the Finals. Challengers for the Special Force Philippine Championship title revealed themselves to be MNL.KNGPN and 1HIT after the Magic 7 faceoff last August 4 at Pacific Intramuros. Special Force 2, on the other hand, will bring in its four champions for the Fin4l 4 showdown on August 17 to trim down the best two of the lot. Freebies for early birds is the best of all. The first 500 Playpark All-Stars 2018 event goers will walk away with a limited edition t-shirt from Playpark's upcoming release - FlyFF Online and early access passes to another big title to be revealed. More prizes and surprises will be revealed as the Finals approaches. There's also community events wherein every player who will join any of the events prepared by their favorite Playpark games especially for their communities has a chance to win in-game prizes. Limited edition game bundles for each game are also available to purchase. Kicking off the crowning of the Philippines' newest champions is a special performance from Team Philippines, Daisy Siete. Fresh from their victory at the KPOP Cover Dance Festival 2018 held in Seoul, South Korea, Daisy Siete is gearing up to wow the crowd at the Playpark All-Star 2018 Finals with their world-class moves and the hottest Korean tunes. All the thrilling action at the Playpark All-Stars 2018 Finals will be amplified by the veteran voices of the hosts and casting team. Hosting the event is seasoned host and caster – Justin Villaseran, also known as Vill – alongside Playpark's resident girlfriend – GM Jaq. For the first time, Playpark's very own GM Leah Chan will be channeling her inner event correspondent by hosting the online stream. To give the blow-by-blow action of every tournament, expert shout casters are making up the PPAS2018 Casting Team – Badz and Baemax for Cabal Online, Sh1nBoo for RF Online, GM Jabie for Special Force Online and Special Force 2, and Tatz for Audition Next Level.